DKS is a 100% privately held company, established and owned by Finn Aagaard who originally is a professional hairdresser. Finn Aagaard had his own salon for several years, after which he started as a salesman for cosmetic products. In 1975 he established Dansk Kosmetik Salg (Danish Cosmetics Sale) – DKS – as a one-man firm. He bought wholesale products, which were stocked and sold from his private address. He drove out and sold the products during the day, packed in the evening, and did invoicing and bookkeeping on the weekends. In 1976 Finn Aagaard started producing his own product line – DKS Products – and moved to Støvring, where DKS now has 3000 sq. metres for production, warehouse, and administration. 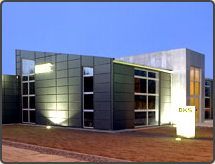 DKS hair- and bodycare products are available on the Danish consumer market and are also exported to several countries.